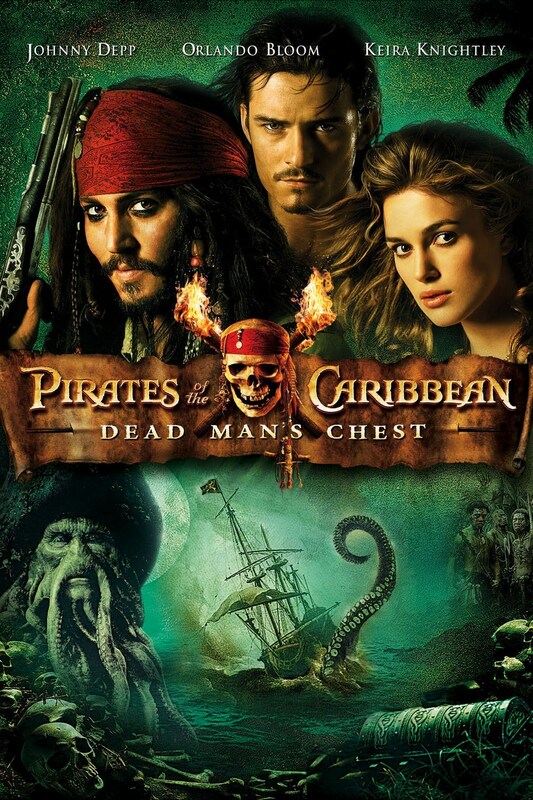 Pirates of the Caribbean: Dead Man’s Chest (2006), somewhat confounding, somewhat outstanding, and loaded with sword fights and Kraken tentacles. MY CALL: This sequel is a blast. Admittedly, it’s much harder to get into with this very messy plot, but the effects and action and scale retain its ranks high among popcorn adventure films. MORE MOVIES LIKE Pirates of the Caribbean: First things first: you better see The Curse of the Black Pearl (2003; the BEST of the franchise, in my opinion) before you see this! People who love this likely prefer grand-scale worlds as found in the Harry Potter films (2001-2011), The Lord of the Rings (2001-2003) and The Hobbit trilogies (2012-2014), Jurassic Park (1993) and The Matrix trilogy (1999-2003). I’d also strongly recommend the STARZ series Black Sails (2014-2017; 4 seasons). With Pirates of the Caribbean: Dead Men Tell No Tales coming out (2017), I felt the need to revisit the Pirates anthology. Having covered The Curse of the Black Pearl (2003) last week, it’s on to Dead Man’s Chest to continue this outstanding adventure franchise that I continue to adore. This epic saga sequel does many things its predecessor did not. We open on a much darker note with Miss Swann (Keira Knightley; Domino, Love Actually) and Will Turner’s (Orlando Bloom; The Hobbit trilogy; The Three Musketeers, Troy) freedom and lives at stake, the crewmen of the Black Pearl have lost faith in their quirky Captain Jack Sparrow (Johnny Depp), and our new villain Lord Beckett (Tom Hollander; Mission Impossible: Rogue Nation, Taboo) is far less likable than was Barbossa (Geoffrey Rush; Gods of Egypt, The Warrior’s Way, The King’s Speech). Despite the grimmer opening, we see many fleeting notions from part 1 brought to light as Jack’s broken compass finds purpose (destiny, in fact) and his scar-branded wrist’s origin is explained. Both of these mysteries, it seems, are linked to the menacing Lord Beckett’s desires. But what hasn’t changed at all is Gore Verbinski’s fine eye for grandiose scale and gorgeous camera work. Squirrely as ever, Jack Sparrow’s shenanigans continue as he poses as a cannibal chief and is chased across the beach by the whole tribe in a laughable trailer clip. His twitchy mannerisms are back in full idiosyncratic force and if his character was the reason you bought this, then it’s worth the price of admission and then some. But most characters’ motives have become blurred in this complicated sequel. It’s really hard to get behind our protagonist in this sequel. Because…who exactly is the protagonist? In part 1 Barbossa was bad and Jack was the antihero who teamed up with Will and Elizabeth while Norrington and the Governor got in the way, although well-intentioned. The plot was actually rather complicated—but it was well-explained, justified, and easily followable. Now in part 2 the cephalopod-faced Captain Davy Jones (Bill Nighy; Underworld, Shaun of the Dead, Jack the Giant Slayer) is the bad guy, but Lord Beckett is sort of another equally dangerous bad guy from the sidelines, Norrington wants to double cross Jack to get his rank back from Beckett, the Governor is dealing with Beckett to save his daughter Elizabeth, Jack double crosses Will to save himself from Davy… the convolution goes on and on and it really makes it hard to root for anyone. When everyone is double crossing everyone else, who’s the hero? Apparently, it’s Will and Elizabeth against everyone else…sort of. The Flying Dutchman is fantastic. Jones’ malformed crew are an awesome spectacle and a worthy follow-up to Barbossa’s undead pirates, with Davy Jones at least nearing the menace of Captain Barbossa and the crew’s sea affinity/curse affording every bit the supernatural touch we desire. Despite all this Herculean effort in adding numerous new personalities to our story (e.g., Davy Jones, Beckett, the Witch, Bootstrap Bill), something is missing from this film—from the whole experience. The Curse of the Black Pearl (2003) created a vast world plentiful with characters, but Dead Man’s Chest seems only to have regurgitated that world (just picking up where we left off). And while there is more world-building, our new curse swings in on the coattails of part 1’s Aztec gold and hits with a bit less impact in the flurry of conflicting character motives. Yes, I’m loving all the action and effects and seafaring ship fights and swashbuckling. But the story fails to sweep me away as did part 1. Perhaps I was enamored by part 1’s world-building, but I was so much more invested in it, too. This sequel is very cool; a great popcorn flick loaded with interesting creatures and a great premise. But “cool” doesn’t move me, it just entertains. But let’s talk about its popcorn appeal since this is an OUTSTANDING popcorn movie. Much as being introduced to Avatar’s (2009) flora and fauna, our eyes are candied with the fine CGI details of Davy Jones and his Flying Dutchman. Like the shock of red hair in Brave (2012), each of Jones’ beard-like tentacles move independently with their own personality (it’s quite a sight) and, of course, Nighy brings a splendidly enjoyable personality as well. Meanwhile the ship is festooned with clam clusters that seize shut with the movement of passers-by or the pound of a peg-leg on a floor board, giving the Dutchman a proper life of its own. In fact, while aboard the Dutchman or among its crew there’s always something moving in the background on the characters—sea anemone mouths, Davy Jones’ tentacled pointer finger that seems to have a mind of its own, spider crab legs twitching on someone’s back, a moral eel peeking from a stomach hole. These small yet satisfying details are rich throughout the film and contribute to its ongoing rewatchability. A big selling point in the trailer was the Kraken. Yeah, it’s neat. To a keen eye, the CGI held up…okay, I guess. It’s clearly not so wowing as it was in 2006, but this thing is still a joy to watch and it gets a lot of screen time as its slimy, suckered, wandering tentacles ravage, crack and splinter huge ships to shambles and fling the crew about. And when it roars jettisoning mucousy muck all one can do is laugh. Our plot finds incomplete resolution by its end, which harbingers the return of Barbossa to rescue Jack in part 3. This sequel is loads of fun but, as is the fault of many trilogies, this part 2 exists largely to bridge characters from part 1 and set the stage for part 3. However, with that said, I feel like I enjoy it more now (having seen it before, and now along with part 3) than upon its initial release. In other words, it wasn’t a great sequel back when there were only two films, but it serves as a finely enjoyable 2nd installment of an anthology of now 5 films. ← John’s Horror Corner: Sinister 2 (2015), an unworthy sequel squandering its boogeymen Bughuul for creepy ghost kids.